Card Text Play: Gain 2 if you control more creatures than your opponent. When I play Flaxia, do I count it as one of the creatures under my control for the purposes of resolving its “Play:” ability? Yes. “Play:” abilities are resolved after a card enters play. Therefore, Flaxia is considered “in play” and under your control when resolving its “Play:” ability (i.e. for the purposes of determining which player has more creatures under their control). 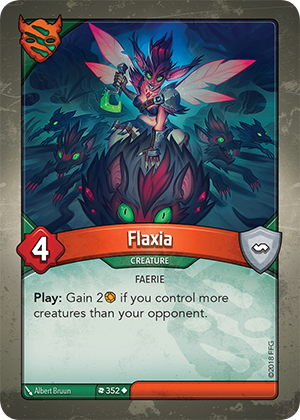 Example: if prior to playing Flaxia, you and your opponent have the same number of creatures in play, playing Flaxia will give you one more creature than your opponent, thus allowing you to gain the 2 Æmber from Flaxia’s “Play:” ability.